Hello! I'm Stephanie, a scooterist, blogger, martial artist, and professional picture book illustrator. Please see my Patreon page for a full and current bio, and information about my latest travels! Below is archived from 2015. Ten Sleep Brewing Company, WY. Photo courtesy Justin. 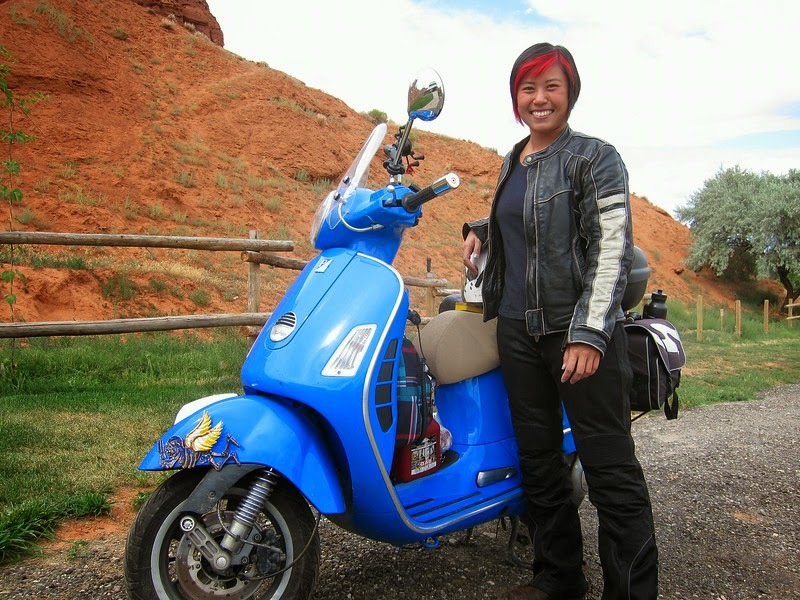 My name is Stephanie, and I started riding in 2010. I didn't want a car but could use more than a bicycle, but I had no idea it would lead me here. Two years later and two starter bikes in, I test drove a brand new 2009 Vespa GTS 250. An hour later, the title was mine. Since then, I've taken it on groceries runs, day trips, and then longer trips. I attended rallies, and visited 2 of North America's capitals on scooter. I drove it through all seasons, and took it camping. I had it painted blue, after a run-in with the asphalt on a rainy Boston day. 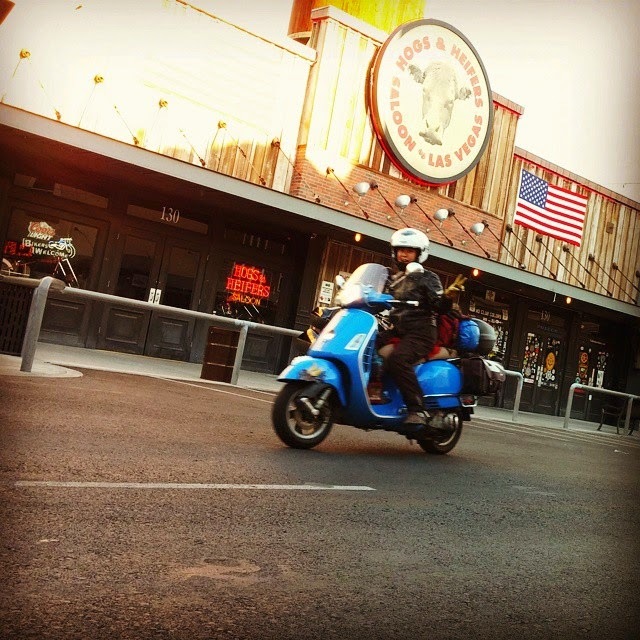 This year, I plan to take my scooter on its greatest journey yet: across America, to all four corners of the United States. Whatever doesn't fit into a local storage unit will be sold to help fund travel or donated, and I ride without a home to return. All I know is I'm going coast to coast — everything between remains to be decided. 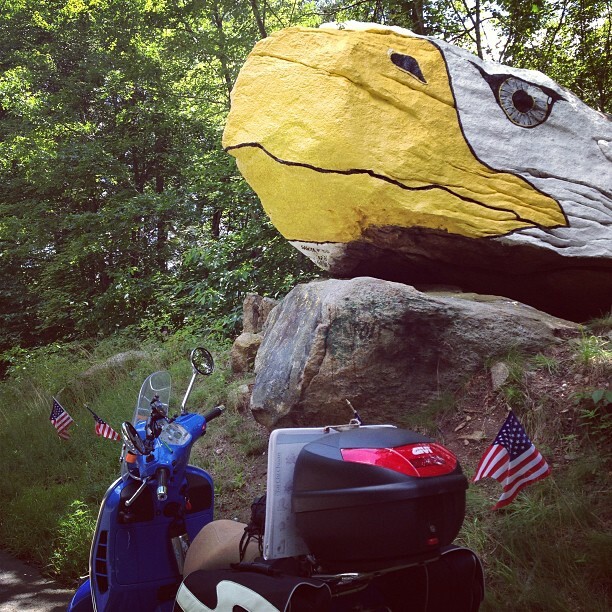 Follow me across America on my 250cc scooter! Perhaps you're wondering why I would do such a thing? Although I'm American, I grew up mostly in international communities in Beijing and Hong Kong. I often feel like a stranger in my own nationality, but I like getting to know it. There's an undeniable romance to the tradition of the American road trip, and I've long wanted to write my own version. As it turns out, it will be on 12 inch wheels. Luckily, I don't have to quit my job to set off. I have an ongoing career as a children's book illustrator (check out some of my work on Amazon), a profession I chose with flexibility of schedule in mind. With a few book series just wrapped up, I feel I'm finally in a position to take this bonus feature a little farther. My dream would be to go full nomad and sustainably ride and work from my scooter (illustration or otherwise), but I'm still chasing that one. In the meantime, I aim to create at least one drawing or comic for each day on the road and post it here. This way I can share the experience, have a place to point new people, and friends and family have a way to know that I'm safe. Oh yeah, and hopefully at the end I'll have something to remember it by, maybe even a book of my own. Although I have 6 years of good memories in my adopted hometown of Providence, RI (one of several homes I've picked up over time), I'm searching for the next step. There's no going back for me. I'm fortunate to have good health, my scooter, and supportive friends and family. It's time to pare down and wander. See you around? Thanks for the photo, Steve. The name of this blog comes from the displacement of my scooter (as you may have guessed), but also from the short journal comics I wrote and drew, 50cc Superhero. Love your blog. So inspiring. Your drawings are awsome! I wish you a safe and happy infinitiy trip! Greetings from Croatia! just listened to your story on motorcycle and misfits podcast! you are so amazing and also inspiring! How To Choose The Right Mobility Scooter For individuals dealing with minimal motion, a Mobility Scooter is a fantastic movement aid that allows them to live separately and also make life a little bit easier. A mobility scooter is a mechanized car that helps people living with a movement handicap, or, individuals recouping from disease as-well-as the senior to execute their day-to-day tasks.